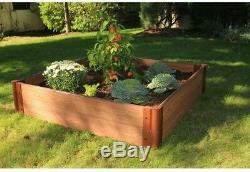 Outdoor Garden Bed Kit Expandable 4 x 4 x 11 in Square Wood Composite Raised. Frame It All Simple Modular Gardens. The gardens that grow with you. The One Inch Series 4 ft. Composite Raised Garden Bed Kit can be used as a stand-alone raised garden bed or as a module to extend any Frame It All Raised Garden Bed System. If your love of gardening runs deep, youll appreciate the extra soil depth the 4 ft. Almost any type of crop will thrive in an 11 in. Patented anchor joint allows installation on hard surfaces (such as rooftops, patios or decks) and traditional soft surface landscapes. Of available planting area youll find many uses for this versatile kit. Eco-friendly timbers are made from recycled plastic and natural fibers, no toxic chemicals. Frame It Alls modular system allows endless design options, you can add on or reconfigure your raised garden bed at any time using existing or additional One Inch Series Frame It All components and accessories. Low Maintenance - timbers will not rot, warp, splinter or fade. Composite boards are made from 38% post-consumer recycled plastic and 62% sustainable hardwood fibers. One Inch Series composite kits are made from 1 in. : 48 Color Family: Wood Material: Composite Product Weight lb. 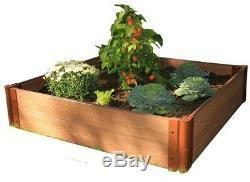 : 40lb Raised Bed Features: Expandable Returnable: 30-Day Shape: Square. The item "Outdoor Garden Bed Kit Expandable 4 x 4 x 11 in Square Wood Composite Raised" is in sale since Monday, January 29, 2018. This item is in the category "Home & Garden\Yard, Garden & Outdoor Living\Gardening Supplies\Plant Care, Soil & Accessories\Baskets, Pots & Window Boxes". The seller is "epicdeals2919" and is located in Luckey, Ohio. This item can be shipped to United States, Canada, United Kingdom, Denmark, Romania, Slovakia, Bulgaria, Czech republic, Finland, Hungary, Latvia, Lithuania, Malta, Estonia, Australia, Greece, Portugal, Cyprus, Slovenia, Japan, China, Sweden, South Korea, Indonesia, Taiwan, South africa, Thailand, Belgium, France, Hong Kong, Ireland, Netherlands, Poland, Spain, Italy, Germany, Austria, Bahamas, Israel, Mexico, New Zealand, Philippines, Singapore, Switzerland, Norway, Saudi arabia, Ukraine, United arab emirates, Qatar, Kuwait, Bahrain, Croatia, Malaysia, Brazil, Chile, Colombia, Costa rica, Dominican republic, Panama, Trinidad and tobago, Guatemala, El salvador, Honduras, Jamaica, Viet nam, Uruguay.